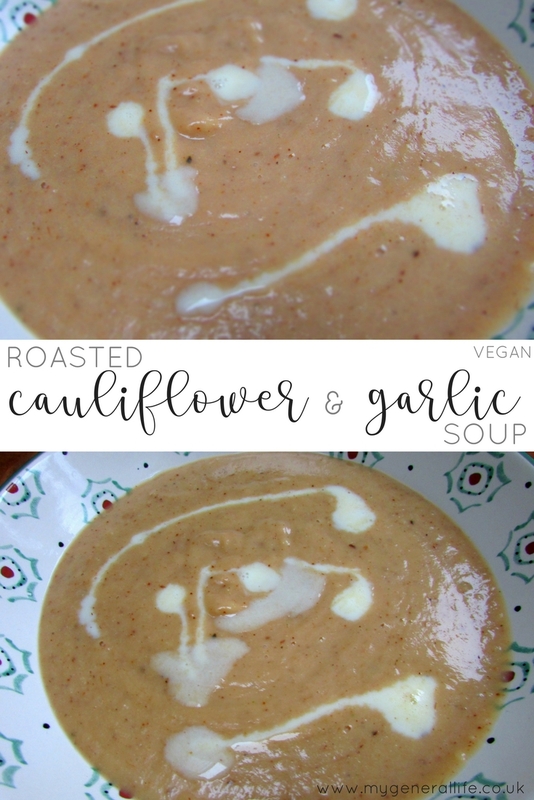 Roasted Cauliflower & Garlic Soup [VEGAN]. 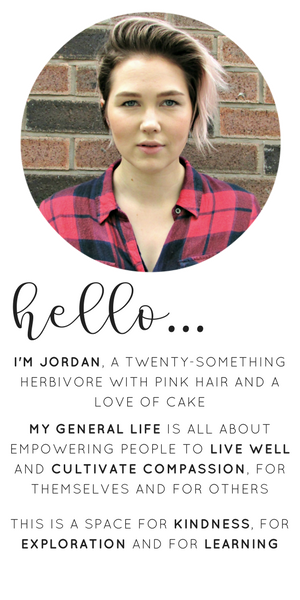 So I've been ever so slightly AWOL for the last week or so - my blogging mojo may have got up and done one. But I've hunted it down and we're on speaking terms so today I wanted to share a really quick, easy and super delicious soup recipe that can be whipped up with minimal effort. Cauliflower is not something I eat very often. I only ever really ate it smothered in cheese sauce. In fact back in my fussy eating days, cauliflower cheese was pretty much the only form of veg I would think about touching. How times have changes! Anyway, since going vegan cauliflower cheese just doesn't have the same appeal, yes vegan cheese sauces taste nice, but they just ain't real cheese. So after doing a bit of perusing of Pinterest for inspiration I decided to try my hand at creating a roasted cauliflower and garlic soup. This soup really does require minimal effort, all you need to do is chop and then let the oven and food processor do the rest of the work. Roasting the cauliflower and garlic brings out such a rich flavour, plus the combination of cauliflower and potato makes for a deliciously creamy soup without a drop of cream replacement in sight. As I write this post, I've actually eaten this soup for lunch and dinner today, it's that tasty (and quite frankly I couldn't be arsed to cook anything else!). Anyway, enough jabbering on, let me tell you how to make it. ♥ Place the cauliflower, onion, potato and garlic cloves into a roasting tray. Drizzle with a little oil of your choice and season with salt and pepper (or any other flavourings). Roast in the oven for around 30 mins (the more roasted the veg, the darker the soup will end up being). 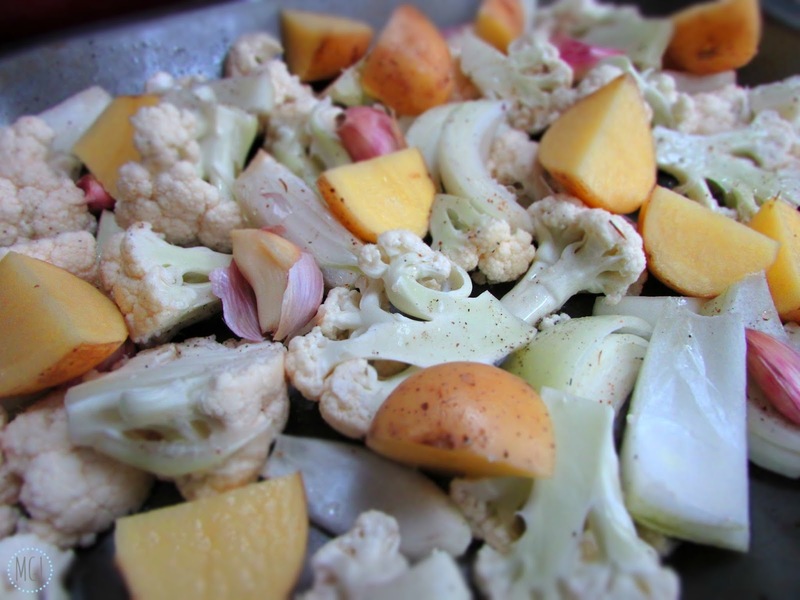 ♥ Once roasted, remove the garlic from the tray and take the skins off. ♥ Place half the roasted veg mix, 5 of the roasted garlic cloves, half the bulgar wheat and half the stock into your food processor and blitz until smooth. Decant into a bowl/pan. ♥ Repeat the previous step with the remaining veg, garlic, stock and bulgar wheat. ♥ Season your soup as you wish, you could also add a little more stock if your soup is too thick for your liking. 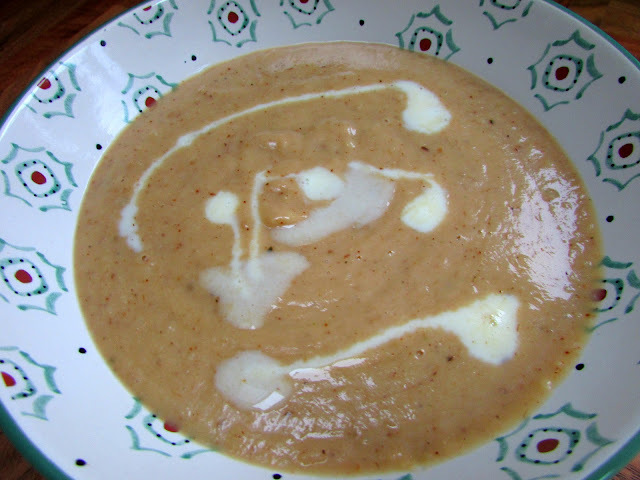 ♥ Serve and ENJOY - I really enjoyed dipping a toasted crumpet into this soup! So there we have it, I like to think it's pretty simple and honestly the flavour is delicious. If you're not a mega fan of garlic then of course use less, but I think roasting it makes it taste so wonderful and it adds great depth of flavour to the soup. Thank you so much for taking the time to read my posts and leave a comment, it's very much appreciated!! Pear & Pistachio Cake [VEGAN].